Well-received and highly recommended by building officials and construction practitioners, this OBOA-endorsed title explains the significance of Bill 68 changes to the Building Code Act, 1992 and its Regulations, and the Building Code. Endorsed by the Ontario Building Officials Association – Members receive a 10% discount. To order please contact Customer Service at 1-800-387-0899 or email orders@lexisnexis.ca. 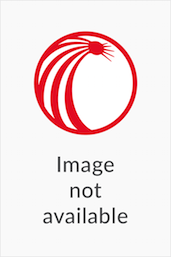 Well-received and highly recommended by building officials and construction practitioners, Annotated Ontario Building Code Act, 2019 Edition is the only legal source you need for the Building Code Act, 1992 (including recent amendments under the Modernizing Ontario's Municipal Legislation Act, 2017) and the 2012 Ontario Building Code. With section-by-section commentary on the statute and numerous user-friendly and time-saving features, this comprehensive reference will noticeably speed up your research. Coverage includes unreported cases, giving you the full information that you need. Practical advice and valuable insights are offered by Jeffrey L. Levitt and John Mascarin, leading experts in the field of building and construction legislation who have variously advised and represented the province, municipalities, building practitioners and consultants with respect to the legislation. John Mascarin, M.A., LL.B., is a partner with Aird & Berlis LLP in Toronto and is a member of the firm's Municipal and Land Use Planning Group. Mr. Mascarin is a Certified Specialist in Municipal Law: Local Government and Land Use Planning and Development Law. He received his LL.B. from Osgoode Hall Law School and was called to the Ontario Bar in 1989. He is the longstanding Editor-in-Chief of the Municipal & Planning Law Reports and the Digest of Municipal & Planning Law. 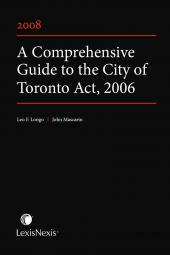 He is the co-author of Ontario Municipal Act & Commentary, Annotated Land Development Agreements and The Annotated Municipal Act, 2nd Edition and A Comprehensive Guide to the City of Toronto Act, 2006. He recently contributed the Municipal title for Halsbury's Laws of Canada. Mr. Mascarin is an Adjunct Professor at Osgoode Hall Law School. He has written and spoken extensively on topics in the municipal, planning, development and real estate law areas. He is a Past Chair of the Ontario Bar Association, Municipal Law Section. 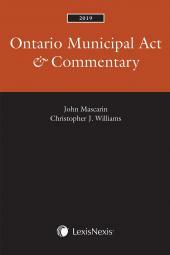 Mr. Mascarin is also the Integrity Commissioner for a number of municipalities in Ontario. Jeffrey L. Levitt, M.A., LL.B., was formerly counsel with the Legal Services Branch of the Ontario Ministry of Municipal Affairs and Housing. He was called to the Ontario Bar in 1985 and was in private practice from 1985 to 1988. Since 1988 he was a Counsel at the Ministry of Municipal Affairs and Housing and its predecessor, the Ministry of Housing, and at the Crown Law Office – Civil of the Ministry of the Attorney General. His law practice at the Ministry of Municipal Affairs and Housing and the Ministry of Housing had an emphasis on construction regulatory law, including the Building Code Act and Ontario Building Code, and he was involved with most amendments to that legislation during that period. Mr. Levitt has been a frequent speaker on the topic of building regulatory law at legal and industry conferences and has contributed articles on these topics in legal publications, including the Digest of Municipal and Planning Law (Carswell), Municipal and Planning Law Reports (Carswell) and Municipal Liability and Risk Management, and the Ontario Building Officials Association Journal.